Excerpts from the address by Rohitha Bogollagama, Minister of Foreign Affairs, at Carlton Club, London on June 9. Those of you who have known Sri Lanka or Ceylon as some of you are used to calling us, are I know always keen to have news about our country. I sometimes tell friends here in cricketing parlance, that we have made a good score and are still not out. I am sure this captures the indominatable spirit of our people despite numerous challenges. Incidentally this year marks 60 yrs of independence, and don't forget we were the first British colony to have universal adult suffrage dating back to 1931. I am proud to say, that 60 yrs on, we have remained a functioning democracy and successive governments have never wavered from democratic traditions. I have to remind that it was the British who introduced us to cricket. We have now perfected the art and on some occasions, in fact many occasions, shown that we can play it better! However the story of Sri Lanka's success has evolved with several grave and serious challenges which were unforeseen at the time of our independence. We have been confronted with the monster of terrorism but I do not need to elaborate. This very club as you all know was bombed by the IRA in 1990, at around this time of the evening when people were having their dinks and dinner as we have been indulging this evening. Terrorists strike at the most unexpected time and they hit innocent civilians who are unfortunate enough to be there. 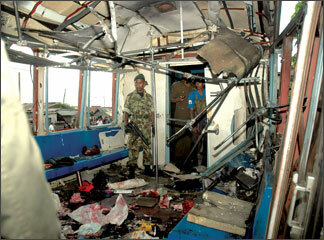 Just before I left Colombo a bomb exploded in a civilian bus during the morning traffic rush, 21 civilians were killed instantly and many others injured, this was the fourth bombing in ten days. Terrorists seek to destroy the very foundations of our civilised way of life and our democratic traditions by attempting to win their demands by unleashing terror instead of through the democratic process. I will endeavour to draw examples from recent developments in the East of Sri Lanka to illustrate how the government's initiatives have led to democracy triumphing over terrorism. There are those who claim that "one man's terrorist is another man's freedom fighter". I will tell you with experience of our conflict that this is a most dangerous claim because it assesses the validity of the cause whereas terrorism is not a cause, it is an act. An act of terror, of killing, suicide bombing, destruction. One can have a perfectly valid cause or grievance, yet if one commits terrorist acts, it is terrorism regardless of whatever cause or grievance there might be. The Government of President Mahinda Rajapaksa has fully recognised that our communities have certain grievances which need to be redressed. It was for this purpose that he set up an All Party Conference within a month of being elected to office. Through this mechanism the Government has sought to reach a consensus on finding a political solution to these grievances particularly of the minorities. The All Party Representative Committee (APRC) has made a series of interim recommendations which the Government has accepted in full and set about implementing. Most notably the full implementation of the 13th Amendment to the Constitution which introduced wide devolution of power from the Centre to the provinces at the periphery through the provincial councils system. Experts talk of corrigible and incorrigible terrorist groups. The LTTE in Sri Lanka has demonstrated that it is not interested in peace, not interested in serious political negotiations but only a perpetuation of terror and mayhem. I must remind you that President Rajapaksa no sooner than he was elected to office offered to negotiate with the LTTE. I was part of the government team that met with the LTTE representatives in Geneva on two occasions and once in Oslo. We asked them to discuss the core political issues that constitute the perceived grievances of the community they allege to represent. However, they refused to do so and instead made demands for concessions on the ground that would favour them militarily and strategically. When we stood our position with the proviso that their strategic demands could be looked at with time, they walked out. A previous Government entered into a Ceasefire Agreement (CFA) with the LTTE and expectedly they used this period to re-group and smuggle in arms and more importantly violated the provisions several thousand times, relegating it to a mere piece of paper. This was partly because the Ceasefire Agreement itself was flawed from its very origin. It was not linked to a process of decommissioning the LTTE and ensuring political negotiations linked to a settlement. The LTTE has in these 30 years of conflict killed more of the very community they claim to represent with a view to silencing dissent. They conscript children, introduced to the world the art of suicide bombing and are part of a trans-national crime network which according to recent studies by institutions like the IISS has commercial transactions with the al-Qaeda network. What does a Government faced with this conundrum do? We have to protect and safeguard our people from the perpetrators of terror whilst at the same time not losing sight of the grievances and aspirations of our people. We have been compelled to use our Armed Forces to target and take on terrorist installations with precision avoiding civilian casualties. Our government is fully aware that military victories never provide solutions but they can provide the space for political and economic solutions to be found. Confronted with ruthless terrorists we have realised that without military power the result can be more bloodshed. Let me give you an example of what has happened in the Eastern province of Sri Lanka to illustrate my point. Our Armed Forces carried out a military operation which cleared parts of the Eastern province of Sri Lanka which had been infiltrated by the LTTE. In these areas they had conscripted children, unfairly taxed the people and unleashed untold violence and misery. The Eastern province of Sri Lanka is a very significant part of the country due to its ethnic composition. The population in the province is almost equally divided among the three major communities i.e 1/3rd Tamil, 1/3rd Muslim and 1/3rd Sinhalese. In the Batticaloa district 70.8 per cent are Tamil according to the last official census (1981) whilst in the Ampara district 41.5 per cent are Muslim. In the Trincomalee district 34.3 per cent are Sinhalese. The LTTE had committed horrendous massacres in Muslim and Sinhala villages, with the last straw being the deprivation of water to the farmers and the inhabitants in that area of the east. Their objective was to subjugate the other communities with the barrel of the gun. Following targeted military action by our security forces, today the eastern province has been completely cleared of the LTTE. As a result, between March and May this year we have been able to hold Local Government and Provincial Council elections in areas where there had been no elections for over 14 years when they were under de-facto LTTE control. 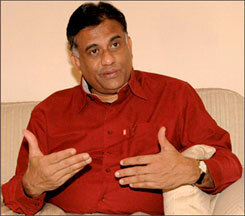 One of the most significant aspects of this election was that a breakaway faction of the LTTE decided to renounce the path of violence, register as a political party called the TMVP and contest the elections in coalition with the UPFA, they secured the majority i.e 52.21 per cent of the vote in the Eastern province (obtaining 20 seats in the provincial council). The significant aspect of this was that due to the coalition arrangement, they campaigned for support among all the communities and received a mandate from a cross-section of the people in the province drawn from all communities. The main opposition party similarly contested in a coalition and secured 42.38% (15 seats in the provincial council). Accordingly the ethnic composition of the elected members of the council are seven Tamils, eight Muslims and five Sinhalese. There was a voter turnout of over 65.2 per cent. These elections were monitored by local and foreign observers and their conclusion was that the election was by and large free and fair. Sivanesathurai Chandrakanthan who has now become the Chief Minister of the Eastern province of our country previously played an active role in the LTTE. He and his members have renounced violence and entered the democratic process. As leader of the party that secured the majority of the votes he was appointed as Chief Minister. However, he has agreed to work together peacefully with all the communities including opposition groups that comprise this province. This indeed is a huge victory for democracy over terrorism but it is a very hard won victory and it must be sustained for the betterment of the people. You are all familiar with the peace process in Northern Ireland. It is a challenge for those who have turned 'their swords into ploughshares', to get accustomed to doing things through the democratic process, when they had been used to achieving it through the barrel of the gun. But our patience and determination to rid our country of the scourge of terrorism and restore democracy must be correctly understood. It's endorsement by the people at the elections is the best indicator. We have now launched a massive development drive in the Eastern province. We are encouraging investors to go into the East because we have to ensure a peace dividend to the long suffering people in these parts. We are confident that the Government's 'Re-awakening of the East' programme will truly result in a transformation, for the betterment of the people who live in that province. The Government is equally determined to clear areas of the Northern province still in the clutches of the LTTE and to restore democracy and bring about rapid economic development in these areas too. Expectedly the LTTE has launched a two-pronged effort to stymie our efforts to dislodge them. The LTTE has launched a vicious campaign of suicide bombings in Colombo and its environs to bring pressure on the Government to halt its military operations against them. It has simultaneously used sections of its diaspora to appeal to the international community in a campaign to discredit our government. To cry foul over alleged human rights violations, when the LTTE is the worst perpetrator of violence, killings, abductions and so on, this could sometimes be an irritant, as ground realities seem to be ignored. I must however emphasise at this point that our Government takes with utmost seriousness concerns about alleged human rights violations which are attributed to it. We have well established institutions to investigate these allegations and been extremely transparent in allowing access to UN Special Rapporteurs and in our reporting procedures to the Human Rights Council. We are signatories to all major international human rights instruments and a chapter on Human Rights has been incorporated into our Constitution with justiceable provisions. We take with utmost seriousness our obligations to respect the Rule of Law and those arrested under the provisions of the law have to be produced before a court of law. We have maintained transparency in these matters but we must not engage in textbook theories and be unrealistic. There needs to be sensitivity to the ground situation and the international community must understand the enormity of the challenge. I have placed before you some of the challenges that Sri Lanka faces today in its determined effort to restore democracy and defeat terrorism. The Government is fully and utterly committed to addressing the grievances of all communities in our country through a political process. This process cannot be concluded through artificial deadlines or at the pace of other's wishes nor according to textbook theories. The situation is extremely complexed. Previous Governments have introduced far reaching political solutions but they ended up becoming a dead letter. Why? Because they failed to garner consensus, and the architects of these solutions failed to listen and consult the majority of our people. I do not need to tell you how democratic processes work. But I can assure you that the Government is not pursuing a military solution to address the grievances of our people, but yes, it is using the military to root out terrorism. As I stated at the very outset of this presentation, we should not miss the wood for the trees. We should not confuse causes that communities and groups represent with untempered terror tactics and naked terrorism. One last issue I would like to touch on briefly before I conclude is on terrorist fundraising and procurement abroad particularly in the UK. Recently some LTTE activists were arrested by your authorities. According to reports they had been procuring remote controlled devices, Toughnote Laptops, circuit boards, powerful magnets used to attach mines to ships and various other items here in the UK which were being used to detonate explosives and to activate mines. Besides through various front organisations disguised as charities and companies they collect funds largely through coercion but also through commercial activities to fund their terrorist campaign in Sri Lanka. Many of you present in this room are Parliamentarians, important opinion makers in this country. We appeal to you to do your utmost to help us by preventing the UK being used as it is being done now to raise funds and to procure military goods to destabilise our country and destroy our people. I know the LTTE has been proscribed here and also in the EU but they mushroom through fronts even religious and charitable organisations, and you need to help us deal with this challenge. Sometimes your country is preoccupied with the challenge from Al-Qaeda terrorism but as my President stated in his address to the UN General Assembly last year "Terrorism anywhere is terrorism. There is nothing good in terrorism". I am sure you will agree with me on that.